I meant to do this the other day, but I was traveling (what a shock, huh?) 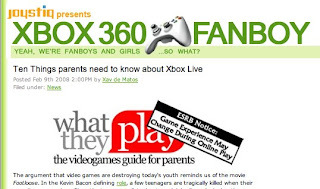 I wanted to give a quick shout out to Xav de Matos at Xbox360fanboy for his positively glowing write-up of our "Ten Things Parents Need to Know About Xbox Live" piece on What They Play. 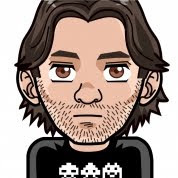 The comments on both his site, and ours have been really interesting - particularly those discussing the merits and pitfalls of Xbox Live voice chat. We'll be hitting the other online services soon (for those that have asked) and hopefully we can turn this into an ongoing dialog about managing what our kids see and hear when they're playing online. Thanks for the shoutout John, just caught wind of it today! The work that you and your team are doing at What They Like Inc. is incredible and it has the potential of really setting the stage for intelligent discussion between non-gaming parents and their children when it comes to our favorite hobby.